The KOVOX spol. s r. o. company has been established in the year 1994 by the privatization of the smitther´s shop in Barum Continental Otrokovice. There have been many progressive changes since the foundation of the Kovox company in the manufacturing technology and used components in compliance with the customers´requirements and due to the available assortment of the high top constructional elements and materials as well. Our consideration of the possible work´s quality improvement of our company has resulted in the fact that only an introduced quality management system in accordance with the relevant ISO standards and meeting of the related legal regulations are the basic preconditions for the implementation of the strategy of quality . 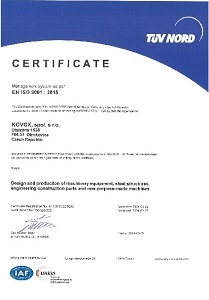 That´s why we have started preparation for the certification according to (ČSN) EN ISO 9001 at the beginning of the year 1999. Our effort has been successfully finished by the certification audit, made by the world-known company TÜV Rheinland at the end of the year 1999. The recertification audits give an evidence, that the QM system continues and is up to the standards for the certification´s validity.